The nation’s second-largest state is also one of its reddest. In 2012 and 2014, Republican candidates for president, governor, and U.S. Senate all topped 57 percent of the vote in Texas, and the state has not had a non-Republican governor or senator in more than 20 years. But even in such seemingly inhospitable terrain, the Green Party is making inroads. This past June, 2017, Alexsandra Annello won a seat on the El Paso city council in a run-off election. She garnered more than 60 percent of the vote against an incumbent. In 2012, two Green candidates for statewide office (state Supreme Court and railroad commissioner) received nearly 500,000 votes each, and the Green Party national ticket received more than 24,000 votes after receiving fewer than one thousand state­wide in 2008. Two years later, Green U.S. Sen­ate nominee Emily Marie Sanchez took 1.2 percent of the vote, and U.S. House candidate Antonio Diaz finished second in a three-way race with 15 percent of the vote. In 2016, Green George Altgelt was elected to the city council in Laredo, a city of 250,000. Texas is a red state, so there is no ‘lesser evil’ risk in voting Green. 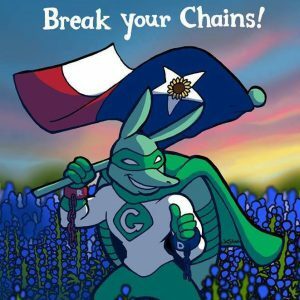 The Green Party of Texas (GPTX) already set a new record in 2016, with more than 50 candidates running for offices across the state. There are candidates for the U.S. House in 19 of the state’s 36 districts. This was the first time the Green Party fielded candidates in a majority of the state’s races. 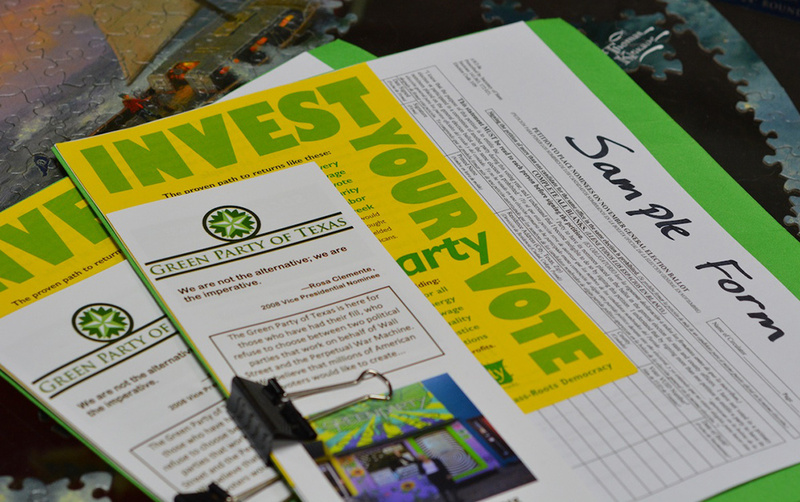 GPTX has held workshops to prepare for a petition drive for ballot access. Five people have already declared to run for specific offices in 2018 with others intending to run for an undecided office. But there are challenges in organizing in a state that covers more than a quarter-million square miles and that has more than 250 counties. Co-chair Laura Palmer says, “Because the state is so large, party cohesion is one of our biggest challenges. Getting to know party members in other areas, keeping track of the status of local parties, and having the ability to screen volunteers for key roles are all enormous concerns.” Palmer says the GPTX has started to implement an “intentionally regional approach,” urging locals in the same parts of the state to work together. Still, as America is changing, so is Texas. As of 2010, nearly 38 percent of the state’s population was Latinx, with 45 percent of residents non-Latinx whites. Only one out of three students in the state’s schools today are non-Latinx whites. Poverty, social justice, and the need for single-payer healthcare all resonate here, as does ending the drug war. Palmer sees opportunities for the party as voters become disenchanted and turn­out declines.